Eastwood Golf Club is set on 48 hectares at Liverpool Road Kilsyth. Eastwood’s 18 hole golf course has long been regarded as the leading clay-belt golf course in the City’s East. Membership enquiries most welcomed. At Eastwood you’ll also find two bowling greens, a function room, bistro, Members Lounge and ATM facilities, all set in a smoke free, friendly and relaxed environment. Eastwood boasts panoramic views and magnificent gardens. We also provide the perfect occasion or celebration at Eastwood our function room is the perfect choice for private functions or Corporate Golf Days. Our Golf Professional Luke Bower offers a fully equipped golf shop and Golf Tuition to help you improve your game. Thanks to some creative thinking, Eastwood Golf Club now boasts one of the most distinctive natural landmarks of any course in Australia. Adjacent to the 1st tee stood a large Cypress tree that posed a safety risk due to its condition and was earmarked to be removed. However, rather than electing for full removal, the Club recognised an opportunity and instead opted to turn the surviving trunk into a unique work of art. 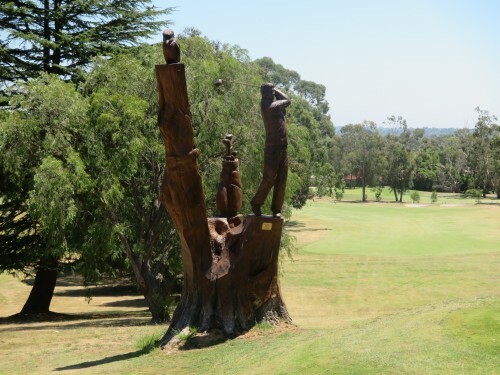 With the assistance of sponsorship from two members, Mike Rawlinson and Roger Earle, the Club commissioned renowned chainsaw sculptor Rob Bast to create a wood carving with the intention of becoming a feature landmark at the course. The design features a golfer with golf bag and clubs, accompanied by birdlife. The project commenced in March 2015 and took two weeks to complete. “The sculpture is simply stunning. Rob did an amazing job and exceeded all our expectations. The skill and level of detail that has gone into the work and what he was able to achieve using chainsaws as his tools is quite incredible,” he comments.